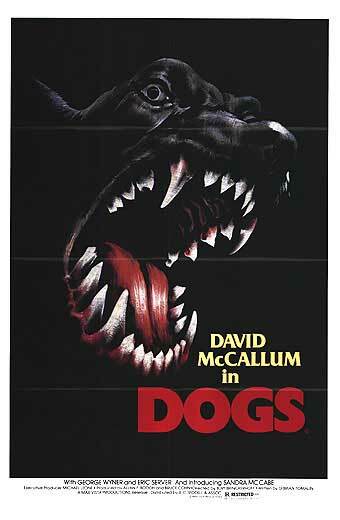 I know why they call this movie Dogs: because none of the people in it are worth a damn. Harlan Thompson (David McCallum), a professor at Southwestern University, has been assisting the local authorities in their investigation of a series of animal attacks, which have resulted in the deaths of several heads of cattle. Baffled by the evidence he's gathered thus far, Thompson asks the University's newest arrival, Dr. Mike Fitzgerald (George Wyner), for some help. What they discover is that the local dog population, gentle and loving pets when on their own, are growing vicious once the sun goes down, roaming the streets in wild packs and attacking whatever, or whooever, they come across. It isn't long before the dogs turn their attention away from cattle, and towards the good citizens of the town, putting everyone, including the students and faculty of Southwestern, in harm's way. For a movie about the darker side of man's best friend, Dogs spends an awful lot of time in the company of its two-legged characters, which wouldn't be so bad if they had something interesting to say. The first half hour or so introduces us to the faculty of Southwestern university, easily the dullest groups of professors and educators I've ever come across in a feature film. Whenever these people get together, whether it be at a dinner party or the local pub, they discuss theory. Even McCallum's character, the “rebel” of the bunch, is dry and boring. There was so much talk of pheromones, hive mentality, etc., etc., that I got the distinct impression the film's screenplay was written by a college professor, and a tedious one at that. Then, following an incident at a Kindergarten Dog Show, we finally start hearing from the town locals, which drastically changed my initial hypothesis. These people are so damn stupid, their dialogue could only have been the work of under-achieving preschoolers. Indignant when they learn that Thompson knew about the attacks on the cattle for days and said nothing, the locals decide to take matters into their own hands, and hunt down the ravenous canines. “Let's form a posse!”, one of them shouts out. Well, OK, Marshall Moron! 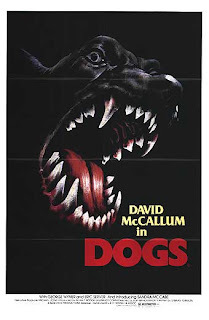 I will say that, when Dogs finally gets around to it, the attack scenes are pretty impressive, many of which are preceded by a bone-chilling sound of what I'm guessing is howling dogs (though it also sounded a lot like a warning siren). Once the title creatures take over, Dogs gets interesting, which I'm betting has something to do with the fact they weren't able to talk. Seriously, I was rooting hard for the dogs in this one.